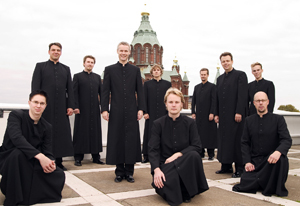 Founded in Helsinki in 1991, Talla Vocal Ensemble consists of eleven male singers with a combined range of four octaves, including the rare male soprano voice and a deep Slavonic bass. Their repertoire extends from Renaissance polychoral works to contemporary music and folk music of the Baltic Sea region. Talla has won several international competitions and is featured on numerous acclaimed recordings, including world premiere recordings made for the Finnish Broadcasting Company. The group is a regular guest at international choir festivals.